Senior Egyptian official says the military operation to destroy smuggling tunnels succeeded in halting terrorist attacks in the Sinai. The Al-Hayat newspaper reported on Thursday that the Islamist terrorist organizations operating in the Sinai Peninsula have been weakened in recent months, partly as a result of the demolition of the smuggling tunnels that connected the two parts of the city of Rafah in Gaza and in Egypt. A senior Egyptian official told the newspaper that before 2011 there were 1,200 active tunnels at the Rafah border, some of which were used to transport people, weapons and ammunition. The number of active tunnels later increased to 2,500 and several of them had several openings on the Egyptian side, often inside homes. The Egyptian official added that most of the tunnels had been destroyed, some at a depth of 2.5 kilometers inside Egyptian territory. 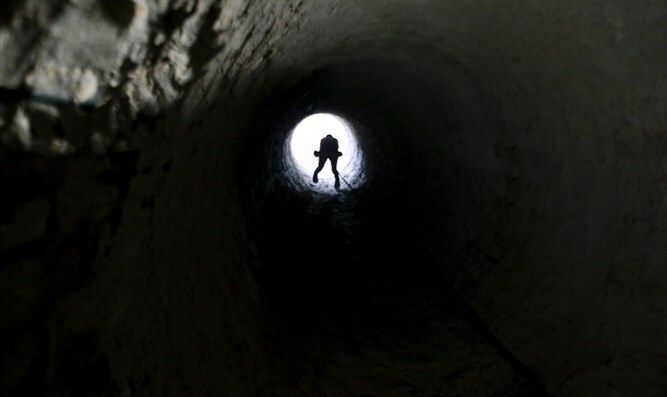 Egypt for the past several years has been cracking down on the smuggling tunnels between Gaza and the Sinai Peninsula after previously having tolerated a smuggling industry. As part of the crackdown, Egyptian security forces set up a five-kilometer security zone along the border with Gaza to allow for the tracking and destruction of new tunnels. The buffer zone was initially planned to be 500 meters wide, but Egypt later decided to expand it. As part of the establishment of the buffer zone, Egypt has demolished hundreds of homes and evicted thousands of residents as it destroyed more tunnels. The official said that Islamist terrorists used the tunnels to flee to Gaza after carrying out attacks against the Egyptian army in the Sinai Peninsula. Activists from Gaza, he added, were integrated into the Islamic terrorist organizations in the Sinai, and some of them assumed leadership roles.